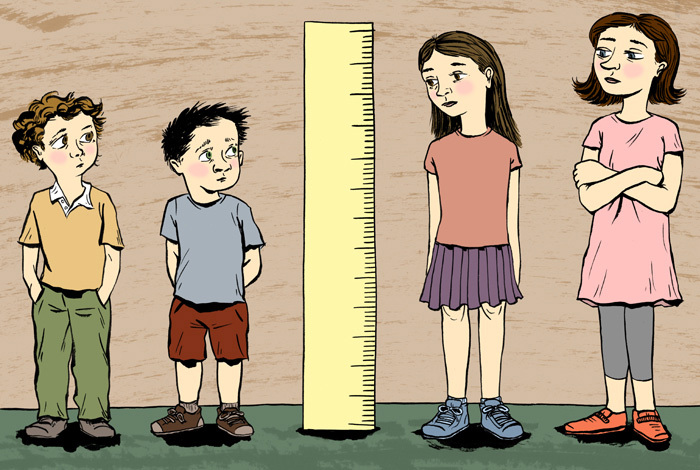 My Tablet magazine column this week is about a children’s book that is nominally about being short. But it’s really a book about media and science literacy. Wait, where are you going? I swear it’s unboring. In Short: Walking Tall When You’re Not Tall At All , author John Schwartz debunks all the “research” about short folks being less happy, stupider and poorer than their taller counterparts, and he does so in a chatty, funny way that mixes memoir (the guy grew up teeny in Texas) and reported non-fiction. The book awesomely teaches kids to question the way studies are constructed and funded…and it teaches them the right questions to ask. Does this study distinguish between correlation and causation? How big is the sample and how well-designed is the study? Do the researchers have an agenda — are they, say, trying to sell humane growth hormone? How did the media report the study’s findings, and is the headline-driven approach really representative of what the study actually FOUND? Anyway, I think it’s a really good book. It’s a quick, thought-provoking read for grownups, and I think an important one for kids. Full disclosure: I know Schwartz virtually through The Well, the virtual community we both participate in, but we’ve never met. Yes, but. I love Randy Newman. Sounds like an interesting book. Thanks for bringing it to my attention. I’m glad your daughter is enjoying it. I would have guessed that you were a Randy Newman fan though – he is often pretty snarly himself – although more tounge in cheek.